Welcome to Kinson Electrical Manchester, we are a local electricians company providing a full electricians service in Manchester, Middleton, Chadderton, Rochdale and Oldham and throughout North Manchester. We have built our reputation over the years as one of the best commercial electricians Manchester has to offer with services that range from full rewiring, house rewires as well as domestic and commercial work. We are also able to provide outdoor lighting solutions, underfloor heating. We can also offer a full test service for both commercial and domestic markets as well as making sure all your LED Lighting requirements are in order. If you require the services of dedicated electrician company then make sure you get in touch with us today so we can help you with your next electrical needs. 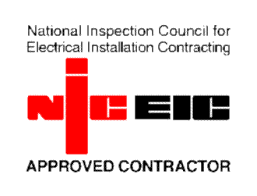 We are fully NICEIC qualified so you know that any electrical work that we carry out will be done with the highest quality you would expect from a local electrician. As well as being highly qualified we are also experienced electricians. You cannot put a price on experience and we have that in abundance. If you need any electrical work carried out whether domestic or commercial then drop us a line today and let us take care of all your electrical needs.